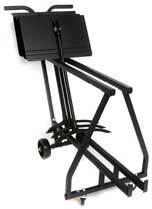 Holds up to 24 Symphony music stands and allows easy storage and removal of stands. Rugged and durable zinc-plated, welded steel construction. Maneuvres easily on all floor surfaces. Designed to hold Manhasset music stands, though other makes and models will fit too. Dimensions: 42" high x 22" wide x 92" long. 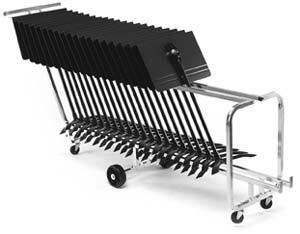 Designed to hold 12 music stands, its overall length is less than 5ft. 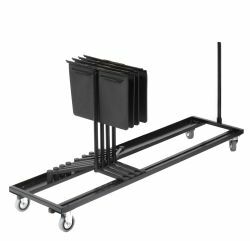 Constructed of welded steel, durable powder-coated finish, high density polyethylene rail liners and roller bearing wheels, this cart will last a long time! Ideal for Manhasset Music Stands, though other makes and models will also fit. Performer Stand Trolley will accommodate 18 Performer Stands. Trolley measures 173cm x 45cm.